Abayomi Omolewu, left, and Oluwatobi ''Tobi'' Olorunsola. SAN DIEGO — Two graduate students from the University of Arkansas were honored at the annual Optics and Photonics conference, one of the two largest meetings organized by SPIE, the international society for optics and photonics. Oluwatobi ''Tobi'' Olorunsola received the MKS Instruments Research Excellence Travel Awards, which enabled him to present his research at the conference, held Aug. 17-23 in San Diego. 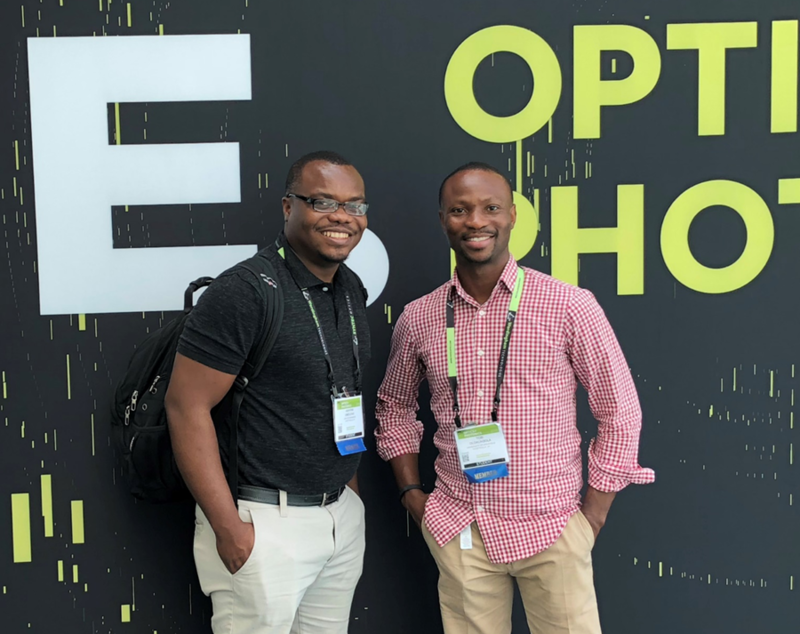 Abayomi Omolewu, the current president of the SPIE Arkansas Laserbacks Student Chapter was also awarded the student leadership travel grant to represent the University of Arkansas at the conference. Tobi Olorunsola received a B.S. in engineering physics from Obafemi Awolowo University and dual M.S. degrees in physics and geophysics from Western Illinois University and the University of Oklahoma respectively. He is a first-year doctoral student in the U of A's microelectronics-photonics graduate program. The work he presented at the conference was advised by professor Joseph B. Herzog in collaboration with other members of the Plasmonic Nano-Optics group, and now Tobi is a member of professor Shui-Quing "Fisher" Yu's Applied Nanophotonics group. His current research interests include developing and characterizing plasmonic nanostructures, semiconductor materials growth and optoelectronic device development. He is also a doctoral academy fellowship recipient. Abayomi is a doctoral student in the U of A's microelectronics-photonics graduate program. The two students are officers of the University of Arkansas student chapter of SPIE. SPIE, founded in 1955 as the Society of Photographic Instrumentation Engineers, is an international professional society that advances emerging light-based technologies through interdisciplinary information exchange, continuing education, publications, career development, and advocacy.